The new StuBistroMensa in Martinsried will be formally opened by LMU and the Munich Studentenwerk today. Since the Biomedical Center (BMC) went into operation in the autumn of 2015, student numbers on the Hightech Campus have more than doubled, and the Students’ Dining Hall there has reached the limit of its capacity. 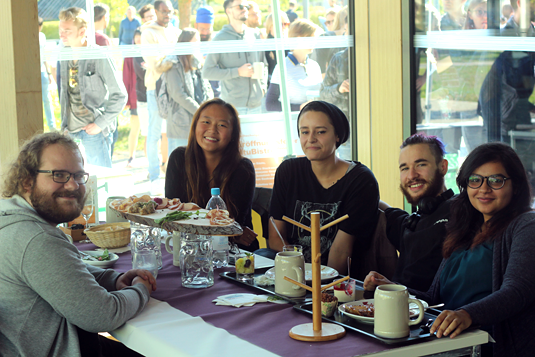 The new StuBistroMensa will not only ease the pressure on the Mensa by providing catering services, it is also intended to serve as a communal area for the Campus, where people can meet and relax. Located directly adjacent to the BMC and opposite the Mensa, the StuBistroMensa can accommodate over 250 guests. On weekdays, it will provide some 800 lunches, and customers can help themselves to one of up to four main dishes on the menu, which changes daily but always includes a vegetarian or vegan meal. In addition to appetizers and desserts, the self-service system includes a selection of salads made with locally sourced ingredients. In addition, there is a live cooking station, where the guest can watch his order being prepared (on the grill or in a wok on alternate days). Special emphasis is placed on the use of local products. The StuBistroMensa is run by the Studentenwerk München. The total floor space available covers an area of 825 square meters, and construction costs amounted to some 7.2 million euros. The two-story building is clearly divided into functional and guest areas. Kitchen, dishwashing and supply areas, and ancillary utility rooms are situated on the western side of the building. The dining area on the opposite side extends over both floors, and is designed as an open wooden framework construction. Cold-rooms and other storage facilities are located in the basement, together with technical service areas. Both external surfaces of both parts of the building are faced with larch planking. 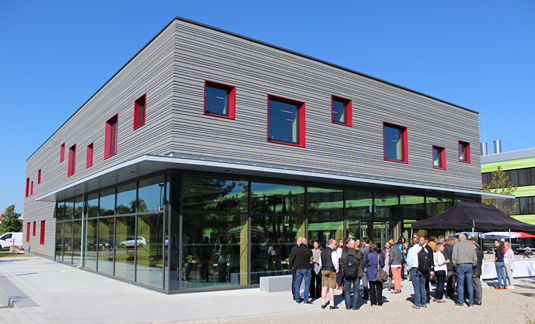 The extensive use of wood on the facade harmonizes with the exteriors of the existing Mensa Martinsried and the Faculty of Biology.